I've added a few photos of some of the birds seen here this past month. .
Wednesday morning we again had an early start, leaving Marathon and heading back toward home. Stops were made to recheck for the neotropic cormorant and golden cuban warblers along Card Sound Road with the same results as on Monday. Before reaching the city environs of Dade County, we made a quick check in the Lucky Hammock area outside of the Everglades National Park with idea of maybe sighting white-tailed kite. no kite but we a look at a strange lizard that was later identified as a basilisk lizard, which is native to Central and South America. It bolted before we could get photos. We passed through Florida City where we added Common Myna to our exotics list of birds. There is a long list of exotics living in the Miami area and this was our next leg on the trip. We made the required visit to the Kendall Baptist Hospital campus and the neighborhood to the north. We actually found only a few species of exotics here to include the large flock of Mitred Parakeets that reside here and several Muscovy ducks and a family of Egyptian Geese. We did add a pair of Coopers Hawks too. Next we visited the Coral Gables campus of the University of Miami. A couple of years ago we had an excellent experience here. Today we had to work a bit harder to find and succeed in finding a large flock of Red-masked Parakeets was seen. Not much else was seen. With rain moving-in we elected to cut the day short to one last stop. Caribbean Cave Swallows were reported nesting in over-passes across the Snapper Canal in Kendall. We headed over the intersection of SW 72 St and Snapper Creek Drive. At first it appeared to be another miss. But then one appeared, then another, then a couple more as they zipped in and out of the under-pass. From here we ended the trip and headed back to Ft Myers. But I'd say I need to revisit Dade County. Egyptian Goose, Muscovy Duck, Mallard (Domestic type), Red Junglefowl, Magnificent Frigatebird, Masked Booby, Brown Booby, Double-crested Cormorant, Anhinga, Brown Pelican, Great Egret, Snowy Egret, Tricolored Heron, Cattle Egret, Green Heron, Black-crowned Night-Heron, White Ibis, Osprey, Cooper's Hawk, Red-shouldered Hawk, Common Gallinule. Sandhill Crane, Killdeer, Laughing Gull, Brown Noddy, Sooty Tern, Bridled Tern, Least Tern, Roseate Tern, Rock Pigeon, White-crowned Pigeon, Eurasian Collared-Dove, Mourning Dove, Common Ground-Dove, Yellow-billed Cuckoo, Burrowing Owl, Common Nighthawk, Antillean Nighthawk, Chimney Swift, Red-bellied Woodpecker, Monk Parakeet, Mitred Parakeet, Red-masked Parakeet. Great Crested Flycatcher, Gray Kingbird, Loggerhead Shrike, White-eyed Vireo, Black-whiskered Vireo, Blue Jay, American Crow, Fish Crow, Purple Martin, Cave Swallow, Northern Mockingbird, Common Myna, European Starling, Prairie Warbler, Northern Cardinal, Red-winged Blackbird, Common Grackle, Boat-tailed Grackle, Shiny Cowbird and House Sparrow. The Yankee Freedom left its dock in Key West around eight o'clock for the two hour, seventy mile trip out to the Dry Tortugas National Park with a full compliment of passengers. Most of the visitors to the park were there to sight see the remains of Ft Jefferson on Garden Key and to snorkel the waters surrounding the key, Seems Bob and I were the only passengers looking for birds. As spring migration has concluded, the attraction for taking all the trouble to reach this remote location for us is the active seabird rookeries. That is why we are here to see the thousands of Magnificent Frigatebirds, Brown Noddy and Sooty Terns nesting on Bush Key, and the Masked Boobies on Hospital Key. This is the only location within the United States were these birds nest. As we neared the Tortugas, the various keys could be seen and as we passed Hospital Key a very distant look at the Masked Boobies roosting there could be seen. And the air is now filling with terns and noddy. As we are approaching the landing our sightseeing guide tells us that the Coast Guard Cutter Sawfish was probable here to collect refuges. This did seem to be the case. As the Coast Guard was leaving with their refuges, seaplanes were arriving with more visitors to the park. Bob stayed busy photographing birds the entire five hour stay and was thrilled with this opportunity and is making plans to return soon. He would wade out into the water with his camera to try for that right shot. I left him to his work as I explored the site.Walking the moat I marveled at the sea life like the reef fish, jellyfish, sea fans etc that could be seen. I envied the folks snorkeling as they were enjoying these sights up close. The fort was once converted to a military prison and one famous prisoner was Dr Mudd, who was convicted of treason for treating the broken leg of the assassin of Abraham Lincoln, John Wilkes Booth. The only land birds I could find were a pair of Eurasian Collared Doves and about two dozen Cattle Egrets. Other birds seen were a lone Laughing Gull, a lone Royal Tern and a Brown Booby seen resting on a buoy just off shore. The tired and sun-burned passengers disembarked from the Yankee Freedom back at Key West about five o'clock. For us it was time to head back the motel in Marathon to rest up from the long day. But we made an additional stop at the Sombrero Beach Country Club golf course in Marathon, because of reports of Shiny Cowbirds and Burrowing Owls. So to top off the day we were successful in seeing a pair of Shiny Cowbirds and a brief sighting of a Burrowing Owl as well as a flew-over of a noisy Nanday Parakeet. This completed a successful day of birding the Keys. Bob Pelkey picked me up at Three AM for our annual birding trip to the Florida Keys. 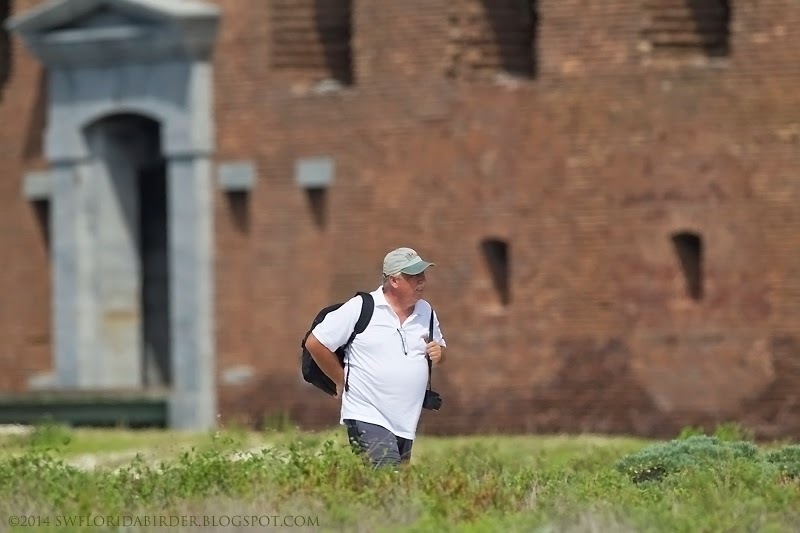 This year we added a day to visit Dry Tortugas National Park. Our goals for this trip were for birds primarily found in the Keys including White-crown Pigeon, Rosette Tern, Antillean Nighthawk, Black-whiskered Vireo, Brown Noddy, Masked Booby and Shiny Cowbird. Our early start was timed for an arrival at sunrise at the Card Sound Road toll booth. This location can be an excellent location for finding Black-whiskered Vireo and Cuban Golden Warblers. This warbler is a Caribbean subspecies of the Yellow Warbler and its only U.S. range is in the mangroves of the Florida Keys. So we expected to find and photograph these birds, but upon arrival found that the location had been taken over by KZK Productions for filming a new series forNetflix. We did manage to hear Prairie Warbler and a Black-whiskered Vireo as we moved on. Herons, Gray Kingbird and a very cooperative Common Nighthawk. White-eyed Vireo and heard a Yellow-billed Cuckoo. Bob also located an interesting lizard called a Bark Anole. Nesting Rosette Terns along with nesting Least Terns can be found this time of year around the Marathon Government Complex. We were succesfull, finally, in locating a targeted species with seeing the Rosette Terns. Magnificent Frigetbirds, Least Terns and Laughing Gulls were also seen here. Curry Hammock is a small park with access on Little Crawl Key and is know for the annual Fall Hawk Watch located here. We did not see much on our stop. A Gray Kingbird posed for us and a couple of Ground Doves were active, but mostly the activity we saw were the basking Green Iguanas. Arriving in Key West around noon we scouted out the island and stopped at Ft Zackary Taylor State Park. Found the park fairly quiet. A few White-crowned Pigeons, Least Terns and Common Grackles. Would have been nice to find some Caribbean vagrants but mostly found more Green Iguana. On the island we saw lots of the Key West chickens, Gray Kingbirds, White-crowned Pigeons and White-winged Doves. Made a stop on Middle Torch Key Road, after leaving Key West as we were returning to Marathon, to look for Black-whiskered Vireos, which we did find along with more Gray Kingbirds and a Key Deer. After checking into the motel in Marathon and getting some rest, we headed over to the nearby airport to await the arrival of any Antillean Nighthawks at sun down. As we waited several Laughing Gulls passed by, plus more White-crowned Pigeons, Kingbirds, Least Tern and even an unidentified parrot. Finally at seven forty-five we first heard then spotted a lone Antillean Nighthawk soaring above the airport runway. But it quickly left the area toward the northeast. By eight o'clock a pair of Antillean Nighthawks appeared, again, briefly, which ended the day's birding.